I loved this outfit when it first appeared on AS&E's cover of issue #93. Imagine my delight when one of baby's stitching "village" let me know that she was working on it for princess. I could hardly wait to get it. I love Dawn's interpretation and it is darling on princess. Thank you again Dawn. The many faces of Evamarie. The back is just as sweet as the front. This is her studier face, seconds before she grabs for the camera. She weighs 22# and is 29" tall. 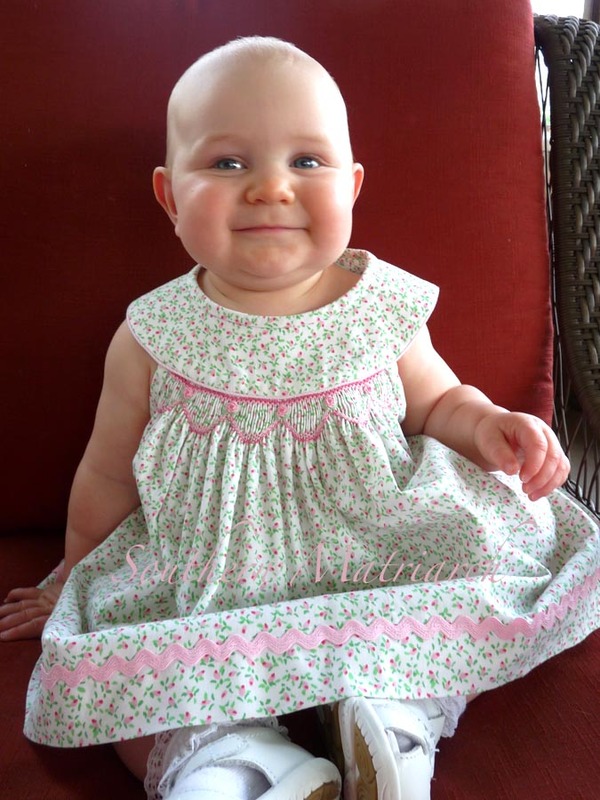 I always want to know how a pattern fits a real baby/child. That is the reason I always tell you the size made and how much my particular model weighs. To help you determine what size to make for your model. Dawn made the AS&E 12 months which is probably the same as an 18 months in US sizing. In ready to wear she wears an 18 months in most things, 24 months in others. I hope that information is valuable to you when you make this darling outfit for your "Kewpie" doll. tired, tired baby. FYI, if you need a baby shower gift- that little glow in the dark seahorse is the ticket. We call it baby crack. Don't even think about putting her to bed without it. I love that, baby crack. 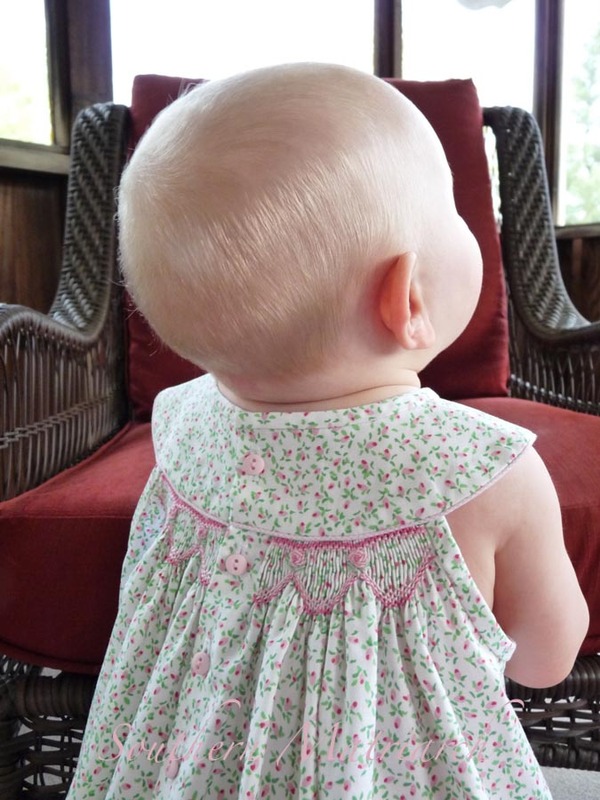 What a lovely dress on a darling baby angel. Just love this sweet dress... pattern is so unique, something different! 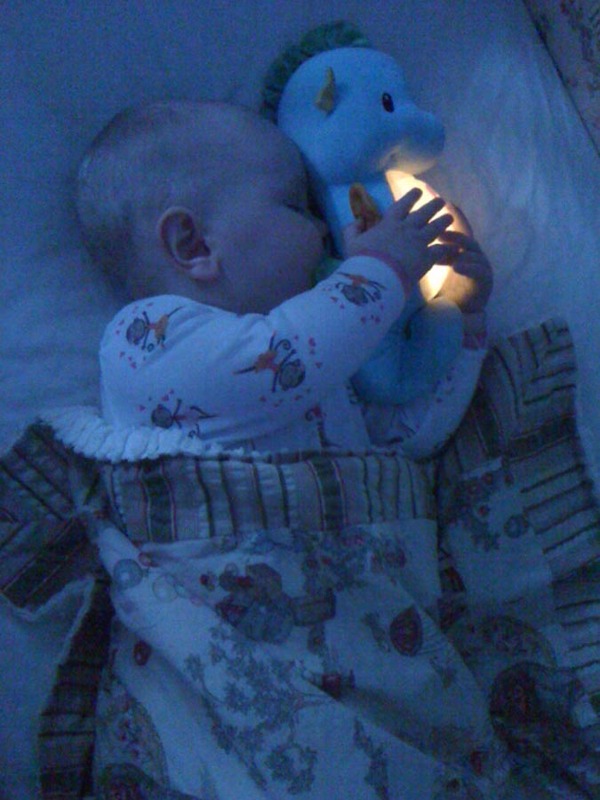 Haven't met a baby who doesn't love those glow creatures! Had no idea the glow creatures were a baby's best friend. Thanks for the tip! That picture is something else with her baby crack lovey. Too doggone cute. That dress is adorable and I love the smocking design on it. I've also had my eye on the very same dress. Thanks for sharing! It does look plenty big enough to last the Summer, the way Evamarie grows I'm always afraid what I'm sewing will be too small by the time I get it to you. Love the glow toy, great gift idea. 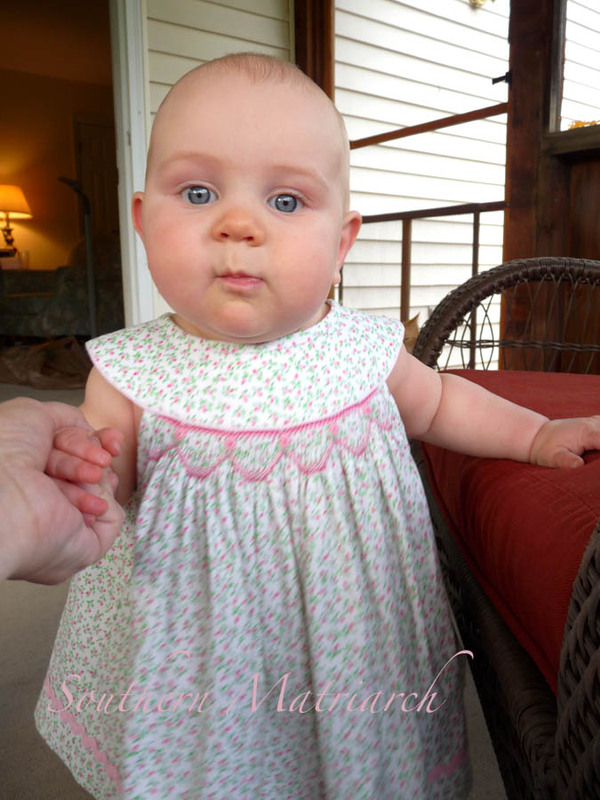 What a sweetie she is in her new dress,l have just traced this pattern off ready to do very soon in cream with red spots it,s lovely to see it made up thank you for sharing. I love the artistry of your sweet garments, your beautiful photography,and your blog is so much fun for me to ramble through in the evenings! thank you!